WESTERN Australia’s CBH Group has this week reported a surplus before rebates of $128 million for the year to 30 September 2018, driven by strong contributions from its operations and marketing and trading divisions. 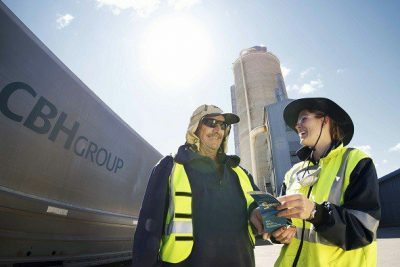 The year saw investment in CBH Group’s supply chain across Western Australia more than doubled, and increased competitiveness for WA growers with a $4-per-tonne reduction in storage and handling fees. CBH passed on $95m of the rebate, or up to $10.50/t, to its grower members, which left the cooperative with a net profit after tax of $33m. Revenue for its financial year rose 9 per cent to $3.8 billion, driven by significantly higher year-on-year grain prices and a slightly higher tonnage traded by CBH Marketing and Trading. This was partially offset by lower grain-handling and freight revenue. Chief executive officer Jimmy Wilson said the group’s surplus was a good result from the business, which had focused during the year on improving services for growers, as well as reducing costs. “The full-year results confirm that our transformation is progressing well and that CBH can continue to deliver low-cost outbound costs and good marketing and trading results for growers,” Mr Wilson said. In the year to 30 September 2018, CBH invested $212m in network capital and maintenance. This was spent on the building of an additional 650,000t of permanent storage in the network, the construction of 1.1 million tonnes (Mt) of emergency storage, 24 throughput-enhancement projects, and ongoing maintenance at key sites. Mr Wilson said the Operations as well as the Marketing and Trading business units each contributed strongly to the group surplus, with operations reporting a $91m surplus, and marketing and trading a $51m surplus. “Our Operations division performed well during the year, with the efficient receival of 13.3Mt of grain, 96pc of which was received at the top 100 sites in the network,” Mr Wilson said. Mr Wilson said CBH’s Marketing and Trading division had an “outstanding” year, returning an increased portion of its surplus to growers. The division delivered a record rebate of $7/t, or $48m overall, to the growers which used its services in the year to September 2018, while the operations division’s rebate of $3.50/t was paid to growers using the bulk-handling network. The maximum available $10.50/t rebate is the second-highest returned to growers in CBH history, behind only $12.75/t for 2016-17. CBH Group said it supplied around 200 customers in more than 30 countries, and was developing markets in Bangladesh, Iraq, Myanmar, Taiwan, Thailand and The Philippines. The marketing and trading division reported continued growth for CBH Fertiliser, with tonnes sold increasing 45pc to 90,000t in the year to 30 September, and significant sales growth delivering a profit of $300,000. Mr Wilson said CBH’s investments had a mixed year. Interflour is CBH’s joint venture with Indonesia’s Salim Group, and owns and operates flour mills in Southeast Asia and Turkey, and the Intermalt plant in Vietnam. Mr Wilson said Interflour’s recently commissioned processing facilities have not been generating expected profits, and Interflour reported its first loss since CBH acquired its interest in 2005, prior to the commencement of a plan to return the business to profitability. Mr Wilson said CBH was well positioned, and would keep its focus on finding efficiencies within the supply chain as it continued to deliver its Network Strategy. “We remain committed to reducing paddock-to-port costs for our growers, and working towards our goal of removing ongoing costs of more than $100m from the business.